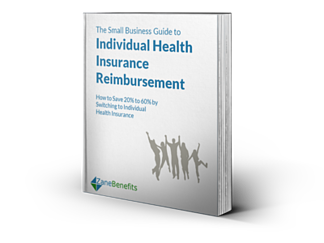 Zane Benefits, the leader in individual health insurance reimbursement for small businesses, announced today the publication of a new eBook, "The Small Business Guide to Individual Health Insurance Reimbursement." The guide helps small businesses switch to individual health insurance reimbursement and offer excellent health benefits at a controllable cost. According to Zane Benefits, small businesses often struggle to compete with larger businesses, and larger budgets, for top talent. As such, many small businesses look to health benefits to help attract and retain key employees. But, there’s a problem. According to Zane Benefits, traditional group health insurance no longer works for most small businesses because of declining benefits, restrictive participation requirements, and increased costs. Of the nearly 6.1 million small businesses in the U.S. with fewer than 200 employees, only 54 percent offer traditional health insurance to employees. That leaves over 2.7 million small businesses nationwide that do not offer health insurance to employees. But these statistics don’t mean that small businesses aren’t interested in offering health benefits. Small businesses need the same quality of coverage to attract and retain employees, but with affordable and controllable costs. The new eBook outlines how small businesses can save 20 to 60 percent on healthcare costs by reimbursing employees for individual health insurance.